Lisa Lynn January 1, 2014 January 1, 2014 34 Comments on Turn Over a New Leaf Giveaway! The 6 Month Membership includes 4 seed packs the first month and 2 seed packs each month for 6 months. All of Mary’s Heirloom seed varieties are open-pollinated, Non-GMO Heirloom Seeds. Your first 4 packs of seeds are mailed right away. 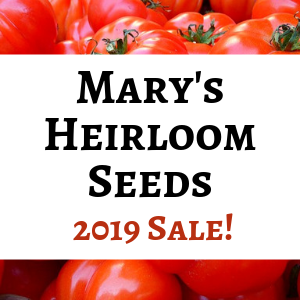 Then each month Mary will ship 2 packs of her fantastic heirloom seeds! That’s 14 packets of high quality seeds with a club membership value of $44! Congratulations to Jennifer for winning this awesome collection! Thank you for a great giveaway, and for all the great posts!! Everyone needs heirloom seeds. I am a new reader. I found you via Google+ and have also liked your Facebook page. Thank you for offering this great giveaway. I am so looking forward to starting some seeds under lights. All this talk of seeds makes me eager to start the spring gardening. Hurry up spring ! Same here, Donna! I concur! Best wishes, Ann Marie! Thanks for stopping by! Coming back 1-5-2014 to enter again! Good for You! Thanks, Sandra! My kids love looking through seed catalogs. Have to admit it is a nice treat when there is so much snow and gray outside to dream about the colors of the summer. Yay giveaway! I’d love more seeds n’ dirt. Best Wishes, Paul! Seeds and dirt are two of my favorite things! I love this giveaway. I just now found your blog and can’t wait to read more. Thanks, Jeanna! So happy to have you reading and stopping by to say hi! i need all the help i can get, with my challenged suburban yard (not a farm). this sounds really cool – there is so much talk about helping the bees and the earth. i renew my effort each spring. That’s wonderful, Mary! Best wishes with your suburban ‘homestead!’ I hope you have a great garden this year! This is a great one! Thanks for doing this! Thanks for stopping by, Nancy! So happy to offer this giveaway! Thanks, Megan! I was lucky to receive one of the amendments to try…I’m hoping to share a review with everyone soon! Pingback: Happy New Year on The HomeAcre Hop! I’m so happy to be able to share this company with you! Thanks for stopping by, Raia!